Dragon City ... 60 per cent already pre-let. than 60 per cent of space, according to leading international real estate consultancy Cluttons. Unlike conventional malls, Dragon City will cater to both wholesale and retail consumer bases and is similar to the Dubai Dragon Mart concept in the UAE. 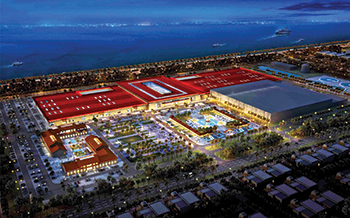 The unique mall design is infused with Chinese architectural and cultural aspects and will incorporate 750 retail store units with 4,500 sq m designated for warehouse space. as consumers looking to capitalise on quality Chinese and local products at wholesale prices. “We expect even greater interest in the remaining units prior to the development’s official launch later this year,” Goodson-Wickes adds. With an expected annual footfall of one to two million visitors, and retailers witnessing the success of Dragon Mart in the UAE, retail units are in high demand. Appointed by Chinamex, one of China’s largest overseas trading companies, Cluttons is the official leasing agent of the multi-million-dollar retail project.